Anoushka, the ever-smiling owner and main chef behind this cute bakery, has been a home baker for a while. 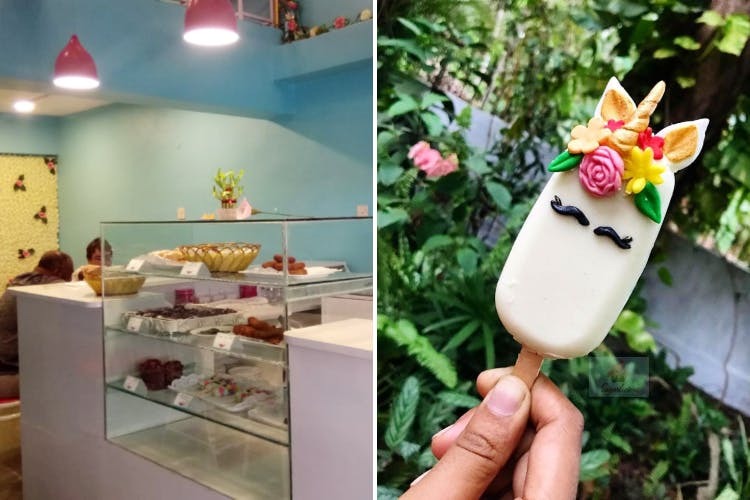 So, Sugarlicious, her bakery cafe in St.Inez, Panjim, was the natural next step. We say, drop by when you want to eat one of her rich cakes without ordering in advance. The minute you enter the cafe, it's the cute dollhouse like interiors that make you go 'aww' and want to take loads of pictures. A beautiful wall covered with artificial roses and the cute little window frame will transport you to one of those hidden cafes in Europe. Having gorged on her delish desserts, we were happy to enjoy savoury baked goodies and sandwiches if we were going to balance that sugar diet. There is a variety to choose from from conventional Goan baked goodies, to her signature Bombay style veggie sandwich. The cakesicle, made from rich chocolate cake and covered with white chocolate on an ice cream stick is what we really loved. Or, try the classic warm chocolate brownie, served with ice cream and that rich chocolate cake, all moist and soft with generous layers of icing. The cafe is hidden away in the lane that makes Kamat Arcade, but worth the search. The baker even takes large or small party orders and makes even speciality cakes (she made a beer keg cake for beer lover recently).